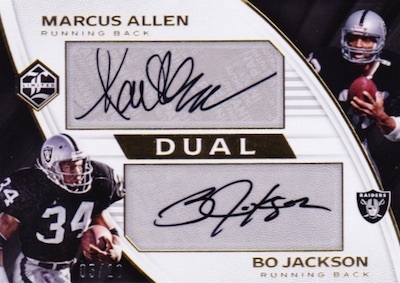 Still offering a more classic elegance to NFL collectors, 2017 Panini Limited Football contains a trio of hits with one on-card rookie patch autograph per box. On the surface, little has seemed to change compared to 2016. However, in addition to a fresh selection of rookies and design tweaks, there are also some new choices to be found. Given that only three cards in the 15-card box act as hits, that leaves plenty of room for the base cards and numbered Spotlight parallels. The 2017 Panini Limited Football checklist really starts to take shape with the RPA subset. 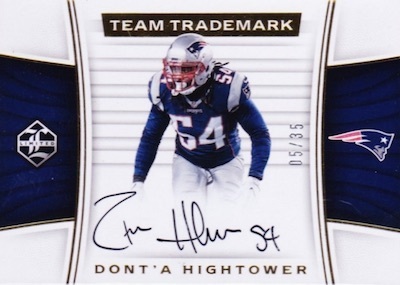 Expected to average one per box, the hard-signed Rookie Patch Autograph set covers some of the top names from the 2017 NFL Draft. 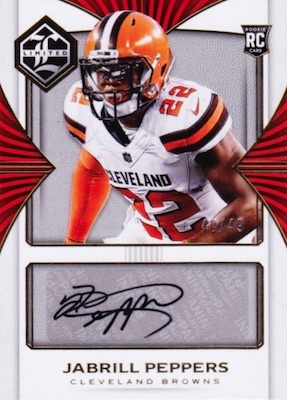 While the main rookie cards are each numbered to 299 or less, the Rookie Patch Autograph Variation set drops that amount to 25 copies and substitutes a larger patch. 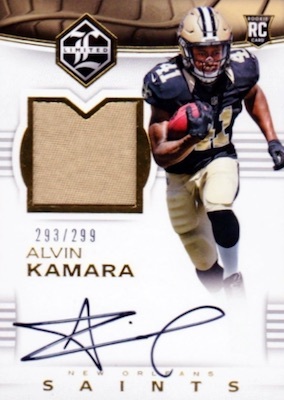 Rookies are also the focus of the Draft Day Signature booklets with pieces of the jersey used on stage during draft day. A new option added to the mix, the signed Ring of Honor insert pays tribute to franchise legends. 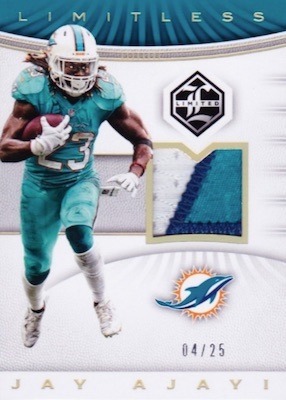 Extending to multi-player cards, the set also features Limited Combos Autograph Jersey, matching rookies and vets, Limited Partnership Dual and Trios Autograph (#/10 or less), which makes connections across the league, and Limited Quad Autograph booklets. 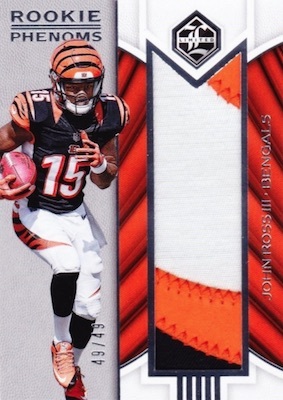 Finally, one of several memorabilia choices that combine to fall in every 2017 Panini Limited Football box, Rookie Phenoms goes with jumbo swatches. 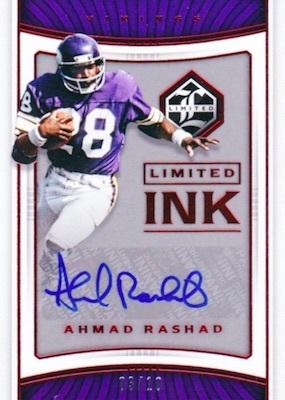 Shop 2017 Panini Limited NFL autographs on eBay. SPOTLIGHT PARALLELS: Silver #/99, Gold #/49, Ruby #/25, Emerald #/5, Sapphire 1/1, Printing Plates 1/1. SPOTLIGHT PARALLELS: Silver #/75, Gold #/50, Ruby #/10, Emerald #/5, Sapphire 1/1. SPOTLIGHT PARALLELS: Silver #/35 or less, Gold #/25 or less, Ruby #/10 or #/5, Emerald #/5, Sapphire 1/1, Printing Plates 1/1. All subjects not included in each parallel. View the spreadsheet for full details. SPOTLIGHT PARALLELS: Silver #/35 or #/25, Gold #/25 or less, Ruby #/10 or #/5, Emerald #/5 or #/3, Sapphire 1/1, Printing Plates 1/1. PARALLEL CARDS: Sapphire Spotlight 1/1. PARALLEL CARDS: Sapphire Spotlight 1/1*. PARALLEL CARDS: Nike Swoosh 1/1. View specific parallel print runs with the spreadsheet. PARALLEL CARDS: Sapphire Spotlight 1/1, Printing Plates 1/1*. 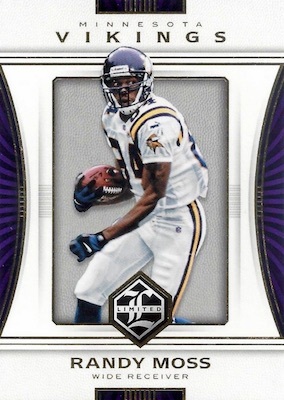 PARALLEL CARDS: Prime #/25 or less, Super Prime 1/1 (No Deion Sanders*). SPOTLIGHT PARALLELS: Silver (Only Eller,Zorn)*, Gold #/10 or #/4*, Ruby #/5*, Emerald #/3, Sapphire 1/1l Printing Plates 1/1. *All subjects not included in Silver/Gold/Ruby parallels. * View the spreadsheet for full details. 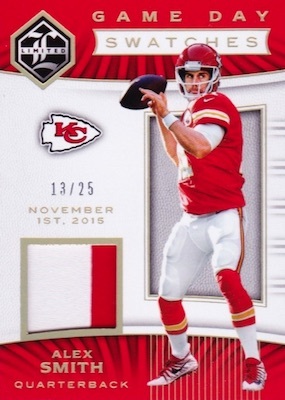 SPOTLIGHT PARALLELS: Silver #/49, Gold #/25, Ruby #/10, Emerald #/5, Sapphire 1/1. SPOTLIGHT PARALLELS: Silver #/35 less*, Gold #/25 or less*, Ruby #/10 or #/5, Emerald #/5 or #/3, Sapphire 1/1, Printing Plates 1/1. *All subjects not included in Silver/Gold parallel*. View the spreadsheet for full details. 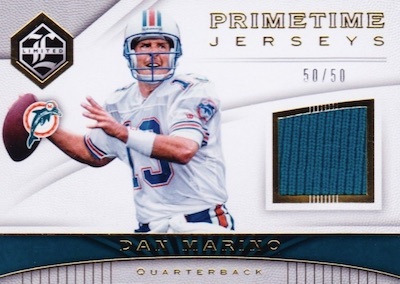 How the heck did Panini manage to chose Jeff Garcia as the Browns “legend” for the base set? Played one season in Cleveland — 2004 — as was a disaster. Ridiculous choice !! As a Browns fan, it’s hard to justify collecting this set. It must be hard just being a browns fan , never mind collecting the set! Ha! This was my favorite box when it first came out, but its gone down the past 2 releases. Lol at the garcia note- joe thomas is a better choice imo. Lots of mediocre players. The guarenteed Rookie Patch Auto is nice, but the other two hits are a toss up. There are some very valuable cards in this set, however there are much better mid-range products out there (Absolute and XR come to mind). I would recommend only taking a chance with this product if you are buying into a group break. Single boxes just aren’t worth it. 2017 Panini Limited Football Box - Hobby - 3 Hits!! !